Strategically located, the tiny Himalayan country is at the center of growing tensions between India and China. Adjoining the Indian Army base is a camp for approximately 120 Bhutanese soldiers who train with the Indians on joint exercises in the rugged mountains that rise up from the Paro Valley. Just another kilometer or so further up the road is a Bhutanese army camp of 24 soldiers and their families. The camp’s sole purpose is to maintain 80 horses to cart supplies to military units higher still on the trail to the Bhutan-Tibet border region. 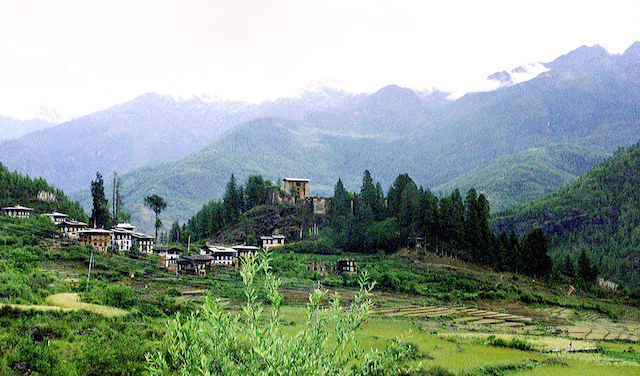 One of the horses’ former destinations, the Bhutanese army base at Gunitsawa, 14 kilometers further up the valley, was accessible only by mountain trail until a crude road was carved out in 2012, the year the base first received reliable electric power. Gunitsawa’s regiment of approximately 90 soldiers sends 15-man units on one-month rotations to three checkpoint huts higher in the mountains; supplying these forward checkpoints gives continuing employment to the army’s stable of horses. 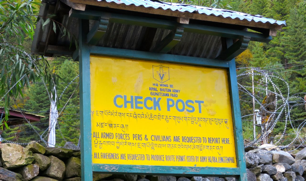 The three checkpoint camps, Gyatsa, Soi Thangthangkha and Lingshi, are Bhutan’s only means of keeping an eye on its northwest border with China’s Tibet region. (Bhutan, a Switzerland-sized country of 740,000 inhabitants, famous for its emphasis on “Gross National Happiness,” has no air force; it relies on neighboring India and Nepal even for helicopter support in the event of emergencies in remote districts). The checkpoints are near a region of Bhutan that Beijing says is its territory, in addition to the claims it has made on Bhutan’s northern border. Bhutanese soldiers report that their usual task on the frontier is to intercept smugglers, but that the Chinese military sometimes crosses into Bhutanese territory via roads China has recently built all the way to the western Bhutanese border. “When they come in, it’s with 15 trucks or nothing,” says one Royal Bhutan Army officer. Bhutan shares a China problem with its neighbor and ally, India. The first foreign state visit by India’s newly elected Prime Minister, Narendra Modi, was to Bhutan, underscoring the importance of Bhutan’s frontier with China, and the strategic vulnerability it represents if China and India were to go to war. From the disputed western China-Bhutan border, China could easily strike India’s geographic “chicken neck” – a narrow band of land, the Siliguri Corridor, that connects the main body of India with its northeastern states, home to 45 million people.